Nothing says summer like and insalata di pomodori, or Italian Tomato Salad. It’s a simple dish. So simple, in fact, you might not think it needs a recipe at all. But in fact—as so often happens in Italian cookery— the simplicity is deceptive. An artfully-made Italian Tomato Salad can be a culinary tour de force, a treat for the eyes as well as the palate. Its finer points are well worth learning about. The great thing about Italian Tomato Salad is its “scalability”. You can make a very basic salad as a contorno, or side dish, perfect for grilled meats or seafood, perhaps enhanced with fresh herbs and onions if you like. If you want a bold flavored salad that could top a bruschetta or frisella, you can add some capers, olives and anchovies. Or you can turn your salad into a main course or light meal with more substantial additions like tunafish or beans. The key, as always in a dish as simple as this, lies in using the best quality ingredients and treating them with care. If you take the time to find some ripe but firm tomatoes at your local farmers’ market and best-quality fruity extra virgin olive oil and follow the tips in this post, you’ll be richly rewarded. Cut up the tomatoes into wedges, slices or chunks, as you prefer, and place them in a mixing bowl. Pour on a generous glug of olive oil, enough to coat the tomato well, and just a drizzle of vinegar if you like. Season generously with salt. Toss the bowl to mix the tomatoes and their dressing. Add one or more of the optional herbs, alliums and other flavoring ingredients, if using, then toss again. Your Italian Tomato Salad can be served immediately, but will be even better if you let it macerate for a while, but not more than an hour. (In this case, hold back on fresh herbs, mixing them into the salad until just before serving.) The tomatoes will exude some of their juices, which are perfectly delicious for sopping up with some crusty homemade bread. For a more decorative presentation, you can top the salad with some additional fresh herbs. Basil leaves are particularly pretty. Needless to say, the success of your Italian Tomato salad will hinge on the quality of your tomatoes. Italians prefer their salad tomatoes semi-ripe and still streaked with a bit of green. Personally, I like them fully ripe but firm. But most importantly, they should be full of flavor. That disqualifies most supermarket tomatoes, although a good brand of hydroponics like Campari tomatoes will do you in a pinch, especially outside tomato season. But much better still are the locally grown tomatoes you’ll find in a farmers market near you. The specific variety matters much less than the quality, although I would look to standard round tomatoes rather than the plums, which are best for sauce. Here in the US, heirloom beefsteak tomatoes are a fine choice, quite similar to the cuore di bue or “ox heart” variety often used in tomato salads in Italy. You can cut your tomatoes into slices, wedges or bite-sized chunks depending on your mood and the size of the tomatoes. Very large tomatoes like beefsteaks are probably best in chunks or, if they are especially large, you may want to lay them out on a plate, and pour the dressing over them rather than tossing them in a mixing bowl. Smaller tomatoes, on the other hand, are best cut into wedges. Medium sized tomatoes are the most versatile, but I like them best cut into wedges. Other than the tomatoes themselves, there is no ingredient more important to the success of an Italian Tomato Salad than the oil. Look for the absolutely best quality extra virgin olive oil you can find—and can afford. Personally, I like the very fruity oils from Puglia or Sicily, although I have to admit that lately I’ve been very content with some very fine oils from California and Chile. The vinegar for a traditional Italian Tomato Salad is always wine vinegar. Personally, I like red wine vinegar, one of the few times I prefer it to white wine vinegar. I find its slightly more assertive flavor pairs well with the tomato’s acidity. But again, it’s very much a personal choice. And as with all salads made in the Italian manner, it’s important to go light on the vinegar. You want just enough to ‘brighten’ the salad, no more. In fact, many people don’t add any vinegar, even if I’ve included it here among the base ingredients. And you definitely want to omit it for some purposes (see below). A short maceration period, as mentioned, improves the salad, especially if your tomatoes are a bit underripe. But don’t overdo the maceration, either, or your tomatoes will turn mushy. Just a few minutes is fine, an hour would be your maximum. No mention of Italian Tomato Salad, or indeed any salad, would be complete without mentioning salt. It really is essential. The very word salad (or insalata in Italian) means ‘salted’, and there’s a reason for that. Italians say that to make a proper salad you need to be a spendthrift with the oil, a miser with the vinegar and the judge with the salt. Not too much, but not too little, either. For a tomato salad, the advice still holds, but I would add a footnote, because tomatoes can take a lot of salt, so be a bit more generous than you might think you need to. I might mention one ingredient you won’t generally see in an Italian Tomato Salad, and that’s pepper. Italians don’t tend to put pepper in their salads, a very common practice here in the US. I remember an American friend I knew in Rome telling me that when she would grind some pepper on top of her salads, her Roman friends would look at here as if she had two heads… Ditto and double ditto for red pepper flakes, which I’ve seen in certain online recipes for “Italian” Tomato Salad. Dried oregano and fresh basil are the most common herbs to use in an Italian Tomato Salad, but tomatoes pair well with any number of other herbs. Use your imagination. But one note of caution: If you’re using dried oregano, be judicious. Its intense flavor will easily overwhelm the other ingredients. Just a pinch will do. Either onion or garlic are always welcome additions, but here, too discretion is key, especially when it comes to the garlic. A single clove will go a long way. In fact, a clove of garlic, cut in half and merely rubbed on the inside of the mixing bowl and then discarded, will lend a lovely, subtle aroma to your salad. As for the onions, they should be sweet and mild. Red onions are ideal. Spring onions, though a bit less common, are also a nice touch. And although not traditionally Italian, a sweet yellow onion like Vidalias would be charming as well. A quick soak in cold water will help remove any sharp onion flavor. The “holy trinity” of capers, olives and anchovies are always welcome in our house, but with their robust flavors I’d serve the salad as a separate course rather than a side dish. If you add more substantial ingredients like avocados, cucumbers, beans or tuna, you’ll have yourself a fine main course or light supper. You’ll find tomato salad in any number of guises in Italian cookery, some of which we’ve freatured already. Surely the most famous is the insalata caprese, where tomatoes slices are laid alternating with slices of mozzarella and basil leaves and dressed in olive oil and salt. (No vinegar, please!) Mixed with stale bread, it becomes either a panzanella in the Tuscan manner or a Puglian-style cialledda. Italian Tomato Salad can also serve as a topping. For instance, it makes for a gorgeous topping for a cotoletta alla milanese. In this case you should cut your tomatoes into small dice and again, omit the vinegar. And, as mentioned, you can also use your tomato salad to top bruschetta or, enriched with olives, capers and other goodies, on a frisella to make a caponata napoletana. Our favourite – eaten all summer long as soon as the first tomatoes are ripe! ! We love regular and heirloom varieties, add tuna frequently and make it pretty much as per your recipe. As you mentioned, we are in the never vinegar camp here. A loaf of good bread, a bottle of wine and this salad- lunch is done. So good! Growing up we had this on the table every night during the tomato season. I cannot think of a more satisfying dish when, as you pointed out, the ingredients are absolutely right. A crusty loaf of bread and that is dinner as far as I am concerned. I’m the same way, Paula. On of the nicest parts of summer are fresh off the vine tomatoes. Many a summer, night our favorite meal if tomato salad and corn on the cob both at their freshest. Thanks so much, Graziano! Sounds like a wonderful combination of flavors. Eccomi! Wow I simply love your gorgeous photography Frank. Nothing beats a fresh tomato salad with plenty of fresh basil leaves. Veramente buona. Have a great summer time. Lately, both my husband and I have had difficulty in digesting garlic so I have been using garlic as a rub on the inside of the prep bowl or just cooking it a bit in olive oil and discarding, it’s extremely effective and not overpowering as garlic sometimes can be. A good Italian tomato salad is one of my favourite dishes in the summer; it infuriates me to see it on menus in the winter when our tomatoes are mealy and tasteless. Although, there is one restaurant that used to serve oven-dried tomatoes with burata and pesto in the winter, probably not authentic but it was damn good (they have a wood-burning pizza oven that they dried the tomato slices in). I just love how authentic your recipes are, and the back-stories are wonderful too. I will save this recipe for when my own tomatoes are vine ripened (probably next week). Tomatoes in the winter are just absurd, I agree! Although that oven-dried tomato dish does sound nice. Enjoy those tomatoes when they’re ready to eat. Nothing like growing your own! I wish we had the sun for it in our yard. Frank…I often see the slightly green shouldered tomatoes in Italy…think they would be amazing with something like Burrata…that small bit of acidity with the cheese would be fantastic! Never see them here though. Summer is all about locally grown tomatoes isn’t it! Especially, if like me, you are a tomato-a-holic!!! Happy Summer to you Frank! They basically don’t exist, I think, in North America. But I did spy some tomatoes that looked awfully like them in our local farmers market last weekend, so who knows, things might be changing. I look forward all year to those beautiful red Jersey tomatoes that ripen in summer, just to have a tomato salad like this. I know what you’re saying about Italians liking their tomato salads with some green in them, but I think they are different varieties that we can’t find here. Eating a tomato that’s green here in the states just doesn’t taste the same. I love those really heavily ridged tomatoes you find in Italy but have yet to find them here. I’m going to have to try getting seeds from Italy for them and growing them in my garden. I too, save the red wine vinegar for my tomato salads. It just seems like a perfect match. You’re right about those tomatoes… and I had a whole dialogue with Stefano in the comments about them! But I have to say, I did see some tomatoes that looked very much like those red-green Italian ones in our local farmers market last weekend, sold as “streak tomatoes” or some such. So things may be changing… ? Thank you so much for showing us the soul of Italian cooking , good ingredients , prepared with care. I am still waiting for tasty tomatoes here on the coast of California. However, I will drive through the Central Valley today were the tomatoes are so much bettter. There is a food stand that has great local olive oil. I know what I am making tonight. Thank you! I’m surprised you didn’t peel your tomatoes. I don’t either, but I’m just lazy. My mother never used a fresh tomato without peeling it. Of course, some peels are thicker than others. A beautiful salad. Thanks for publishing this. Tomatoes are about to come into season and this simple recipe is something that I have never made. I think that needs to change this year! Ben, you definitely should try this! Thanks for stopping by. This is a really great post, Frank! As you pointed out, a good Italian tomato salad can be used in so many ways. By itself, as bruschetta, as a topping for grilled meats. It’s extremely versatile, and it’s easy to adapt the flavors based on what you add in. And I love your comment about “you need to be a spendthrift with the oil, a miser with the vinegar and the judge with the salt.” That’s an excellent piece of advice, and I’m going to hang on to that one! Hope you’re having a great holiday weekend, my friend! Really nice food styling on the photos! And such a great dish — full of flavor, and it screams summer. You make a really good point about the simplicity of a dish like this being deceptive. My palate is much more Italian-American rather than Italian (it’s what I grew up with). So I’m probably a bit heavy-handed with seasonings sometimes (well, very often!). I really need to go to Italy again and just eat. 🙂 Anyway, good stuff — thanks. One of my favorite meals in Italy had a tomatoe salad as the contorno – it was a revelation. And once we moved to Tucson where farm grown tomatoes are almost year round, this has become a staple for us. Simple, yes, but astonishing in its flavors. I recently tried a recipe for tomato bruschetta where the bread was fried in olive oil. The tomatoes were much like your recipe, asking that the salted tomatoes sit for 30min. for the juices to begin to flow. It was delicious. Do you ever fry your bruschetta bread? Another piece of evidence for the case of “simple is best”! 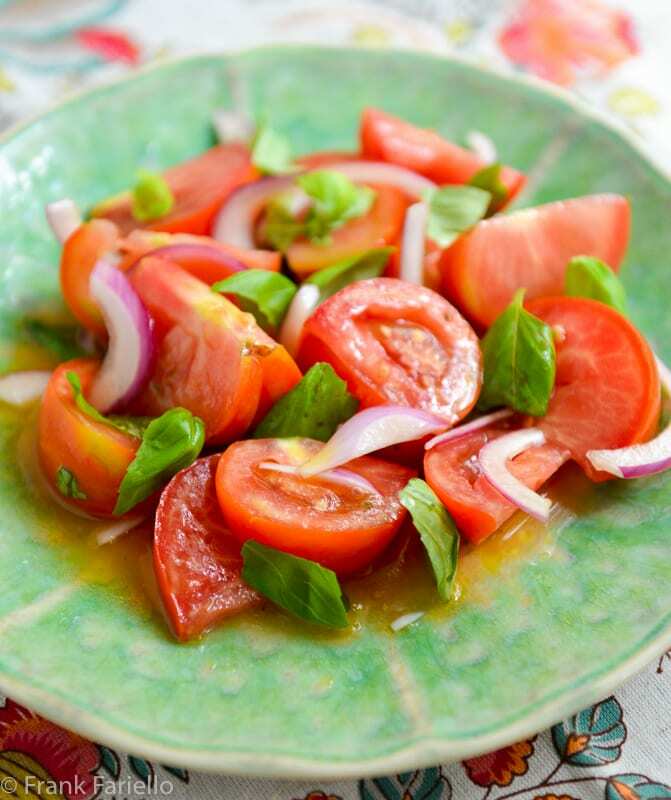 With really good tomatoes, oil and vinegar, this salad is absolute heaven! However, I agree with Stefano on the partially ripened tomato issue. It can make or break a tomato salad. Really ripe tomatoes tend to be soft and just don’t cut it in this salad. I keep telling my daughter to pick our tomatoes for salad BEFORE they’re red. Seems counterintuitive to most people, but I think they’d love it if they knew to try it. I do agree that the tomatoes can’t be soft, although I do prefer them ripe for those delicious juices. Nice that you grow your own and have the option! Can I ask which brand of finishing extra virgin olive oil you use? I haven’t really settled on any one brand but two that I’ve enjoyed are Frantoio Barbera and Partanna, both from Sicily. And for something a bit more affordable, I actually think American Olive Ranch oils are quite good. YUM!! This certainly screams summer. there is nothing like summer tomatoes. They are bursting with flavor and I like the addition of the onion, garlic, and capers. Making this for dinner tonight. Frank, excellent post and an excellent reminder that fine ingredients and simplicity can produce pure joy on a plate. In fact, this is my favorite way to eat fresh tomatoes. Sounds delicious, Ron. It’s true that tarragon is not too common in Italian cooking, but I understand the Tuscans do make use of it in some dishes. And it does pair beautifully with tomatoes, I agree. Grazie Frank, even for an Italian this is a good reminder how how things should be done. Just one comment: a common mistake (from my Italian point of view, other people might say it boils down to personal taste, and I accept that) most foreigners make when preparing a tomato salad is to choose tomatoes that are far too ripe, the ones we would save for sugo in Italy. All the Italians I know make salad with tomatoes that are not fully ripe, ones that are red with patches of green. – it is the mix of sweetness and acidity that makes a great tom salad. Here in England most toms are of the super red variety and I have to travel to some some Turkish shops to get “pomodori costoluti” that are still red-green. And then, as you say, it comes down to personal taste. When I was living in Italy and had ready access to those red-green tomatoes, I have to say, as beautiful as they were, I didn’t much care for them. I did appreciate them in a mixed green salad, since they wouldn’t exude red juice and stain the lettuce. But as I mention in the post, I do like fully ripe, firm but juicy tomatoes in a pure tomato salad, precisely because they give off those juices that I find so delicious as they mix with the oil and vinegar dressing. The other thing I left out, for the sake of brevity, is the fact that, as a general rule, Italians don’t tend to put pepper in their salads, a very common practice here in the US. I remember an American friend I knew in Rome telling me that when she would grind some pepper on top of her salads, her Roman friends would look at here as if she had two heads… Another example of differing tastes, I guess! On the Hazan method of infusing the vinegar with garlic, I’ll have to try that next time. It does sound awfully nice. I went back to her Essentials and found the recipe. I notice that she doesn’t mention those red-green tomatoes either. Perhaps like me she (or her editors?) figured it wouldn’t be practical for her American readership? I also notice she also peels her tomatoes, something I never bother with for salads, even though I suppose it does help them absorb the dressing. Not at all, good to have someone who keeps me on my toes! 😉 And by the way, I was (sort of) wrong about those red-green tomatoes not being available here. I saw some at our local farmers market today, sold as “striped tomatoes” or something like that. Will check out the Bareham book soon.